It's a little late but 100 years ago on September 1st Martha died. Martha was the last passenger pigeon left, apparently, out of the millions that had flown over America until the 19th century. I do find it hard to understand how, no matter what sort of hunting went on and how mechanized, a species that was so incredibly numerous only decades before could become extinct in such a short period of time. And why did no one notice in time to contain more in zoos, etc. Trike, you might enjoy this, it was only on in Scotland, I think, and is available until Sunday. Thanks Ferval, saw it last Sunday, very enjoyable programme. No Health & Safety in those days!!! "The Londoner's Lamentation" - a popular ballad which appeared in the immediate aftermath of the Great Fire of London. Thanks to the wind dropping on this day, September 5th in 1666, the fire had finally ground to a halt - but not before the destruction of 32,000 premises and seven eights of the old capital in the preceding three days. St Paul's Cathedral, a stone structure surrounded by a natural firebreak and therefore deemed a safe repository for precious books, art work and other irreplaceable artefacts, had succumbed the day before - ironically due to the erection of wooden scaffolding at the time in a repair job being supervised by a certain Christopher Wren. September 5th 1808 - a lucky horsehoe story from "The Annual Register" published in London in 1809. The circumstance which we are to relate, though of a most extraordinary nature, has been communicated to us from such authority that we have no doubt that it is accurate in its general outline. We forbear to mention names and places for reasons which will be sufficiently obvious to readers. A few miles from this city in a village which consists of but four or five houses a house of entertainment constantly afforded refreshment for those travellers who made it a resting place. A respectable farmer a very few evenings since having been at the Dublin market resolved to return home early and left town before dinner. Having reached this village he put up his horse at the inn and ordered something to eat. His meal &c being finished and the evening coming on he paid his bill to the landlord from a parcel of notes, one of which he changed, and then departed on his road home. At about a distance of one mile his horse lost a shoe and as a smith's was contiguous to this part of road he dismounted and finding the door closed and the smith gone to bed he knocked until the farrier got up and opened the door. The shoe being replaced the traveller offered the smith an half crown piece desiring to get the change, which he declared at that hour he could not procure. The traveller, feeling that he had occasioned some trouble in disturbing the man, told him that he might keep the entire sum. The poor smith affected by this unexpected generosity eyed him with caution and questioned him which road he had come, and on being informed that he had stopped at the village inn asked him if any money had been seen in his possession in that house? To which the traveller replied that he certainly had a large sum of money in his possession. He immediately cautioned him to turn back to Dublin, for that not two hundred yards on the road before him at a bridge which he described he was certain to be stopped and robbed. To this the traveller replied he was well prepared having his yeomanry pistols charged in his holsters. The smith told him that if he was resolved to proceed he had better examine his arms, the precaution was attended to, and upon opening the pans of the pistols the priming of both was not only thrown out but water appeared to have been poured in. The traveller was resolute and understanding from the smith, who he had now reason to believe was really in the secret, that he should be attacked by one man only the pistols were recharged and he set forward on his journey. On his arrival at the bridge a fellow jumped from the hedge and stopping him demanded a large sum which he said he knew he had about him. The traveller hesitated, suddenly drew forth his pistol, and shot the robber through the heart. It was the landlord of the inn, and whose similar practice of plunder had been constant. The traveller rode back to the inn and asked for the master of the house who was said to be in bed and not to be seen, but insisting on his being produced the servant told him that he was gone out to a neighbour's house. The dreadful circumstances were disclosed and the servants of the house were directed to the place where his body lay. The gentleman returned in safety to town and told the circumstance to several of his friends, and this extraordinary relation is collected from a gentleman who saw the body of the deceased on the very spot where he had so justly met the punishment due to his crimes. sorry, it's vimeo not youtube. Alongside over-hunting and deforestation another factor in the passenger pigeon's rapid decline was simply that it had always existed in such vast flocks. It seems that as a highly gregarious bird that habitually roosted and bred in huge colonies, individual birds needed to have large numbers of their companions around them to successfully breed. By the 1890s when flocks of several hundred individuals still existed (and were still hunted) it was probably already too late. It seems likely that even these large flocks were below the threshold level needed for them to breed. The few kept in collections and zoos did occasionally produce young but never in sufficient numbers to make up the numbers of the aging, dwindling, and increasingly in-bred, captive stock. Interestingly as early as 1857 when flocks of millions of birds were still common, a bill was brought before the Ohio State Legislature seeking protection for the passenger pigeon, not from any moral or ecologic standpoint but simply because they were such as as a valuable natural resource. A Select Committee of the Senate however rejected the bill, stating, "The passenger pigeon needs no protection. Wonderfully prolific, having the vast forests of the North as its breeding grounds, traveling hundreds of miles in search of food, it is here today and elsewhere tomorrow, and no ordinary destruction can lessen them, or be missed from the myriads that are yearly produced." 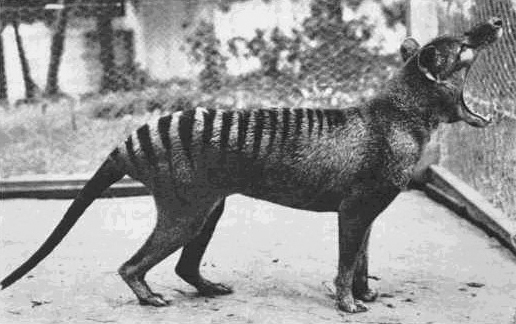 In the same vein as the sad tale of Martha the pigeon …..
On 7 September 1936 Benjamin, the last known thylacine (the so-called marsupial tiger, or marsupial wolf), died in Hobart Zoo, and they probably became extinct in the wild at about the same time. Again too little too late - the species had finally been given protected status just 59 days prior to Benjamin’s demise. Nevertheless there are still occasional unconfirmed reports of thylacine sightings in remote areas of Tasmania. … or possibly it’s Benjamima. The final indignity for poor Benjamin might also be that "he" was possibly a she. Both males and females had abdominal pouches and telling the sexes apart, even as adults, was not obvious, and none of the existing photos show the relevant "bits". September 7th 1525 - The Pistorius Trial ends with a guilty verdict. Pistorius is sentenced to be burned at the stake. Historically there has already been at least one famous Pistorius trial - namely that of John Pistorius, an advocate of church reform who, en route from Wittenburg, was arrested in May 1525 and brought before an ecclesiastic court in the Hague, then still the capital city of the Spanish "county" of Holland. What made the trial special, at least in terms of the reformation period, is that the Hague was also the unofficial centre of political opposition to Spanish rule in the area, a factor that seemed an encouragement in itself for some Hague citizens to be open to the idea of religious reform as another tool of opposition to their masters' Catholic political control. As a result Pistorius, himself no great orator or proselytiser by any contemporary account, found himself the focus of a trial that quickly became something of a rudimentary theological debating chamber in which the role of religion as a political weapon was openly debated for the first time in recorded history. Because of this the "heresy" trial dragged on way beyond the normal time taken to decide such matters, and reports of its progress as well as its examination of religion in an overtly political context were printed and distributed throughout Europe - making John Pistorius's trial one of the earliest manifestations of a "show trial" in the modern sense, with both sides milking the publicity opportunities it provided to spread their political and religious views. Of course for poor John there was always ever only going to be one outcome. His wealthy father's attempt to ransom him, once refused, meant that the Spanish Catholic administration would determine his fate. In the publicity frenzy the Spanish rulers had assessed their own progress, soon realising that the creation of a Protestant "martyr" was of less consequence than the damage being done by prolonging the by now international debate. They therefore abruptly ended the trial with a call for a verdict on September 7th. They had also had some rather strong encouragement to do so. The Spanish-owned Hague was also the centre for the Inquisition's administration in the area too, and at precisely the same time as Pistorius stood in the dock the local Inquisition was "processing" another arrested heretic of their own, "Jan de Bakker", a prominent Hague citizen. Not for them a public debate about their own processes. To prosecute the popular de Bakker for heresy it was essential that Pistorius's trial be resolved quickly and in accordance with their own. John, by contemporary accounts, went to his death at the stake with the defiant cry of "O Death! Where is thy victory? ", and with that entered the annals of Protestant martyrdom (de Bakker following the very next day). There are several monuments to de Bakker in the Hague, him having been a local lad. However poor John Pistorius, even after the splurge of international publicity with which he exited this world, has none. Save of course Donne's sonnet - and what mere statue could ever hope to emulate that? As regards Benjamin, the thylacine. Yes, a sad story. I've seen footage of Benjamin on TV (ancient newsreels obviously) at some time, I'm sure. I think I've mentioned I worked for a while [doing somewhat mundane work; typing dababases] not far from MM's alma mater. In my induction I seem to remember something being mentioned about ships' cats wreaking havoc with some of the flightless native birds in the Antipodes (though can't say that was "this day in history"). Referring to Nordmann's post above, poor John Pistorius, poor de Bakker. It is true, that a memorial like Donne's sonnet is as good in its way as any marble statue, save that, as with all memorials, the subject is not around to benefit from them. If memorials to martyrs of all faiths and none make people think twice about executing people for something which is definitely not "murder most foul" I guess they serve some purpose. Monday, September 8th 1727, had been eagerly anticipated by the children of Burwell in Cambridgeshire for weeks beforehand. On this day there had been arranged that most wondrous of novelties, a puppet show, in their very village! The venue was to be a barn near the parsonage on what is now Cuckold's Row, close to the centre of the village, and the event was set to attract youngsters (and many not so young) from miles around. Rich and poor children alike would receive dispensations from teachers, tutors, foremen and farmers to cease their tasks early and make the journey to Burwell in time for the evening performance. We don't know how many managed to squeeze into the barn before the organisers, fearing for the safety of the audience as more and more turned up at the barn, decided in their wisdom to nail the doors shut. Nor do we know the true motivation of the candle-lantern wielding late attendee who, in an effort to see the performance within, climbed up to peer through an open window. Fifty years later the Ipswich Gazette was to report that an old man had confessed as he lay dying that it was he who had held the lantern and that he harboured "antipathy" against the puppet master, suggesting something even more horrible had occurred than simply a tragic "accident"..
What we do know is that the lantern fell through the window and landed in hay below. The conflagration was rapid and intense, the entire barn becoming an inferno within a few short minutes. Those within found themselves unable to move to escape the erupting flames and worse, those close to the doors found to their horror that they could not budge them. Seventy-eight people (the number is also cited as seventy-nine or eighty), of whom sixty-one were children died. We can only imagine the horrendous injuries inflicted on those who managed to be pulled from the barn alive. As recently as 2005, when a plaque commemorating the tragedy was unveiled on the site (see above), the local villagers found it fit to accompany the event with a solemn parade down to a service held in the local graveyard in which a single plinth marks the burial spot of all the victims on that tragic day in their history. 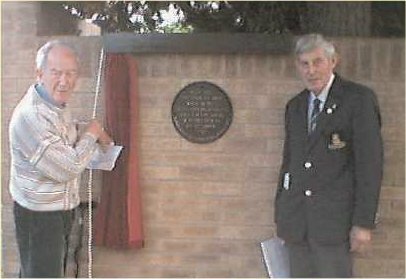 This plaque, along with others marking Burwell's history, was funded from proceeds produced by the sale of Burwell Historical Society's excellent book "Discovering Burwell - 4 circular village walks" written by Mike Pike (seen unveiling the plaque above and who passed away earlier this year). It is always great to see a community in which respect for local history is so well maintained, protected and encouraged. The other two founder members of the Football League, Blackburn Rovers and Notts County, didn't play their first games until the following Saturday. Preston North End won the double, the first ever League Championship and the FA Cup in the 1888-1889 season, a feat which would not be repeated until Tottenham Hotspur did it in 1960-61. I agree that there should be a Scottish Parliament. I do not agree that there should be a Scottish Parliament. Next week, THE BIG ONE. The battle of Flers-le-Courcelette began on 15 September 1916. This battle featured the first use of tanks in warfare. Kind regards from your "associate", Paul. The first of these misses the real origin of the "landship" - the Admiralty's Landships Committee. They were none too keen on letting the Pongoes take over - after all, when they sent armoured Fowler tractors to the 2nd Boer War, the Brown Jobs promptly stripped off the armour for fortifications - then started sending urgent requests for more armoured Fowlers! The St Chamond and the Schneider had even more defects than the early British tanks, but the Renault certainly can be regarded as the forefather of all modern tanks. Gil, thanks a lot for this forum. If you don't find your answers there, you will find them nowhere. Kind regards from your colleague, Paul. 22 September 1914 – On this day, Wenman "Kit" Wykeham-Musgrave, a 15 year old midshipman, was serving aboard HMS Aboukir then on patrol off the Dutch coast with her sister ships HMS Hogue and HMS Cressy. All three ships were obsolete pre-dreadnought cruisers manned mostly by reservists, or newly advanced cadets like young Kit himself. But despite the British and German navies having already clashed at Heligoland just 3 weeks earlier, the ships were neither zig-zagging, nor had they secured their internal water-tight doors, despite their destroyer escorts having been forced to abandon them because of bad weather. At 6:20 am the German submarine U-9 fired a single torpedo which struck HMS Aboukir amidships and flooded her engine room. Without any power she stopped dead in the water, started to list, then capsized and sank about 25 minutes later. 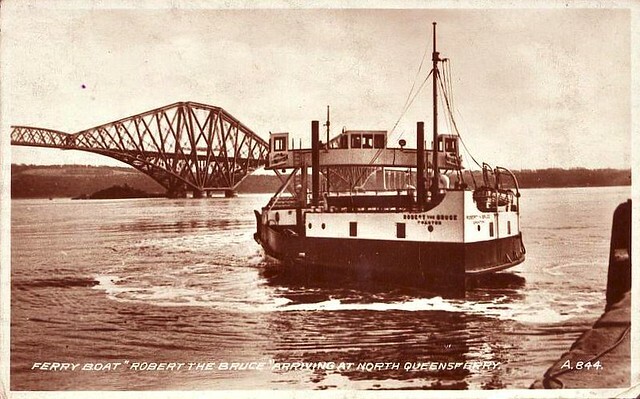 Deprived of power to the hoists her crew had struggled to launch her boats and only one small lifeboat had got away. Thankfully however her two sister ships had immediately hauled to and had started to render assistance. When the order to abandon ship was given Wykeham-Musgrave, in his own words, “leapt into the water and swam like mad to get away from the suction.” He was just clambering onboard HMS Hogue when she was also torpedoed, sinking just 15 minutes later. Back in the water he swam across to HMS Cressy, but had no sooner got onto her deck than she too was struck at about 7:20 and she had rolled over and sunk by 7:55. Finding himself yet again in the water, Wykeham-Musgrave managed to get hold of a piece of driftwood, and he was eventually rescued by a Dutch trawler later that morning. He therefore earned himself the unwanted distinction of being the only recorded RN sailor to have survived being torpedoed on three different ships on the same day … indeed all within about an hour. I can just see all the sailors on the Cressy's starboard rail as Wykeham-Musgrave toiled towards them through the brine, gesticulating wildly while issuing ungentlemanly and very unchivalrous expletive-laden suggestions to the effect that he change his direction! 23rd September, 1967: New Zealanders voted in a referendum asking if people preferred a 10pm closing time for hotels and bars instead of 6pm. 64% voted for the change, unlike in 1949 when the law remained for 6 o'clock closing. The law had been brought in in 1917 during the war as a temporary measure, but was made permanent the following year. The "6 o'clock swill" was a common phrase to describe the drinking culture of the time when men went to the pub after work and drank as much as they could in as short a time as possible before arriving home not necessarily all that sober. I see it being blamed in part on a culture of binge drinking, but we have had open slather for a long time now as regards drinking hours, and binge drinking doesn't seem to have reduced among young people at least. Now opening hours can be 24 hours, though there are growing demands for closing pubs and bars at 3am, and some city areas have a non-revolving door policy after certain hours (ie you can't come into a bar after 3am. I came from a teetotal family so the 1967 change made no difference to us at the time, but I started university in 1968 (still too young to go into bars for a couple of years) and no doubt it was useful to me then, though we did most of our drinking at parties in private student flats. One for Paul, and about national self-determination. I'm surprised no-one has noted this yet but on this day September 27, 1066 William of Normandy launched his conquest of England. And the rest is, as they say, history. Being stabbed, became "the late"
Apparently got it in for me!?!?!?" "Take it easy driving, the life you save might be mine"
Happy Birthday to His Grace, King Richard III of Blessed Memory, born on this day of Our Lord 1452 at Fotheringhay Castle. 3 October 1942, a V2/A4 rocket becomes the first man made object to reach space. "We have invaded space with our rocket and for the first time. We have used space as a bridge between two points on the earth; we have proved rocket propulsion practicable for space travel. This third day of October, 1942, is the first of a new era of transportation, that of space travel." 3 October, 2014. My new grandson, Henry, was born! (My son and dil seem to like rather traditional names - their first son was called Peter). 7lb, 8 oz. Considering his father was 10lb this seems rather tiny to me. I haven't checked what famous people were born on October 3rd yet. Congrats from me as well, Caro. perhaps he'll grow up to be a vet. Let me join the chorus, Caro - that's lovely news. Traditional names do appear to be enjoying a resurgence and I don't think that is a bad thing. I think it's unfair to land kids with names that are too outlandish. I may have posted this on another thread. When I was working in a posh part of London (Kensington) one of my colleagues went to look round Kensington Gardens and heard somebody calling her child, "Come here Oedipus". My colleague was sure she had misheard to begin with but apparently not. As for Mrs West (aka Kim Kardashian) calling her son "North", I'd better not say too much with people being so litigious these days - shall we just say it's not a name I would wish on a child. Congratulations on the new arrival, Caro! Young Master Henry's a Libran then: he'll be balanced, fair, diplomatic, charming, intelligent, artistic, loving, happy - and a right ditherer! Not like his father then - a Leo whose views are always definite, and definitely spoken. My grandmother was a Libran - I think she was fair and balanced and intelligent but I don't know about the rest. However I think it is very hard for children to see their parents (which my grandmother was really to me) as the rest of the world does. Thanks for the good wishes from you all. Well, at least young Oedipus probably loved his mother. 14 October 1066 - Battle of Hastings. This clearly shows use of stirrups about which there is on going great argument re the usage changing dominance of the user in warfare. Always surprising that the Romans did not happen on the notion - and always fun to watch movies with mounted Romans with feet sort of cloaked or never shown. I think stirrups were in established use in western Europe by the time of Charlemagne (ie almost three centuries before Hastings) although they were possibly only introduced a generation or so before his reign. The crucial battle of Tours (in 732), whereby Charles Martel (Charlemagne's grandfather?) stopped the moslem Umayyad advance into France, was won almost exclusively with infantry and with negligible use of French cavalry as they had only recently adopted the stirrup and were still not able to match the (stirruped) Arab heavy cavalry. The Bayeaux Tapestry does also clearly show the Norman cavalry using their spears over-arm, ie stabbing downwards, rather than under-arm as lances. With stirrups, strong chest and girth straps to attach to the horse, and a high back to the saddle to support the shock of impact (all of which were in use in 1066), these same Norman knights would in just a few decades more (say by the time of the 1st crusade), have developed their tactics from being just noble mounted infantrymen stabbing downwards with a a spear, into precision high-speed, high-impact missiles, with the spear as a lance couched under their arm, ie true heavy cavalry. And remember that Roman cavalry generally used the 'horned' celtic-style saddle, which allows the rider a lot more control over their horse as well as giving a much more stable support from which to swing a sword, than is given by a simple stirrup-less horse-cloth. October 15th, 1764 - The Capitoline Vision occurs. Such is the name that historians have given to that moment when, at a loose end following his being demobbed from the South Hampshire Regiment and having embarked on a "Grand Tour" of Europe (as young buckos were wont to do at the time), 27 year old Edward Gibbon is wandering one evening amidst the ruins of the old Roman Forum. Approaching the delapidated Temple of Jupiter he hears, asmongst the rubble, ruined friezes and fallen pillars, the beautiful sound of a choir of friars who have chosen this redolent location to sing their vespers. He stops to listen, enchanted by the ambience of the scene, and then has a sudden idea. In his own words: It was at Rome, on the fifteenth of October 1764, as I sat musing amidst the ruins of the Capitol, while the barefooted fryars were singing Vespers in the temple of Jupiter, that the idea of writing the decline and fall of the City first started to my mind. The rest, as they say, is history. Or in Gibbon's case a very famous history indeed. 15th October 1582, the previous day was the 4th of October, eleven days missing as the Gregorian Calendar was first introduced. Protestant countries would stick with the old Julian Calendar for a while yet, and the Russians even longer. Without Tupaia the travels of Cook would have been unlikely to be successful in any way, since Tupaia's language was sufficiently close to Maori to make communication possible in a way it hadn't been to Abel Tasman. He was also helpful in their navigation over the Pacific. A review of a recent book about him says he was a skilled linguist and orator, an expert in astronomy, navigation and meteorology, of high rank, a devious politician, and though unable to write able to draw a map detailing 4000 kilometres of the Pacific. He died of scurvy-related illness seven months before the end of the journey and his influence and importance tended to be written out of the story. 16 October 1973; according to Tom Lehrer, this is the day that satire died when Henry Kissinger was awarded the Nobel Peace Prize. 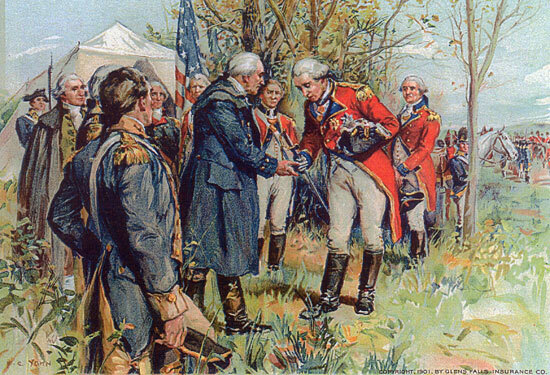 17th October 1777; "Gentleman Johnny" Burgoyne's British Army surrenders at Saratoga, leading to French intervention in the American War of Independence.